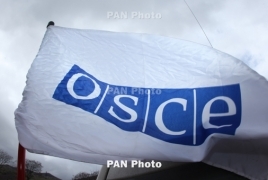 PanARMENIAN.Net - The OSCE Mission on Wednesday, October 10 conducted a planned monitoring of the ceasefire on the line of contact between the armed forces of Artsakh and Azerbaijan, to the south from Gyulistan village of the Shahumian region. From the Karabakh Defense Army positions, the monitoring was conducted by Field Assistant to the Personal Representative of the OSCE Chairperson-in-Office (CiO) Ognjen Jovic (Bosnia and Herzegovina) and Personal Assistant to the CiO Personal Representative Simon Tiller (Great Britain). From the opposite side of the line of contact, the monitoring was conducted by Personal Representative of the OSCE Chairperson-in-Office Ambassador Andrzej Kasprzyk and his Field Assistant Ghenadie Petrica (Moldova), as well as staff member of the Office of the CiO Personal Representative Martin Schuster (Germany). From the Artsakh side, the monitoring mission was accompanied by representatives of the Foreign and Defense Ministries.